Last week, I learned that Philadelphia ice cream is a style of ice cream that uses no eggs. The recipe I’m about to give you is also a no-egg recipe. However, I don’t think this qualifies as Philadelphia-style or any city style ice cream since this ice cream doesn’t include cream either. Right now, I’m calling it My Kitchen-style ice cream because it’s just so damn easy to make. And it’s my kitchen which is generally a pretty nice place to be (well, when the dishes are done and the crumbs have been swept up). No cream, no eggs?! Yessir. It’s more of an ice milk kind of deal. There’s some sweetened condensed milk along with whole milk which takes care of the dairy and the sugar content. But the nice little twist with this is that it uses cold-brewed coffee. That means that there is no waiting until the coffee cools before you add the ice cream mix into the machine. A total time saver! 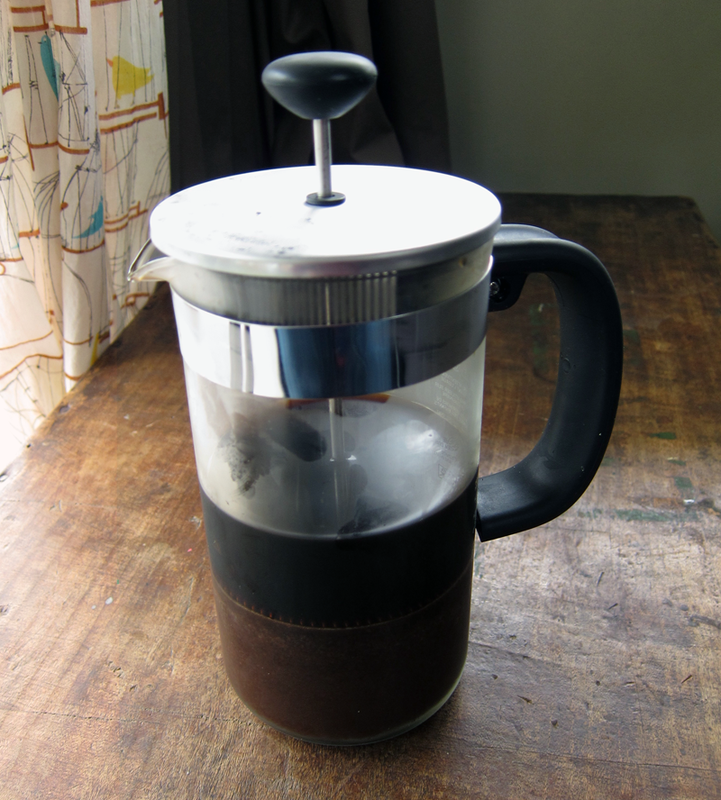 When I first tried cold-brewing coffee back in 2009 it was a flop. I wasn’t convinced of its greatness. But that was then. I’ve had a lot of practice in the meantime (secret: when it’s done, don’t add extra water which only dilutes the brew into a tasteless nothing!). I love it and make it all the time. In fact, I have a french press that I only use for cold brewing (well, and summer camping trips). Come summer, me and cold brewed coffee are BFFs. And speaking of best friends, this is one ice cream that you’ll want to keep by you at all times. My husband and I love it. You could leave out the cocoa nibs and trade them in for some drizzled melted chocolate when the churning is nearly done or some chocolate chips. But I love the intensity of the cocoa flavour without the sweetness. Plus, it seems kinda sophisticated and good for you. So enjoy this kitchen style ice cream all summer long. elsewhere: It’s summer (or so they say) so why not get prepared with some tasty drinks. These summer sparkling lemon drop cocktails at Poppytalk make a great patio sipper. Bottoms up! In a large bowl, whisk together the condensed milk, cold brewed espresso, whole milk and a pinch of salt. When it’s all blended up, let it chill if the ingredients you’re working with are room temperature. 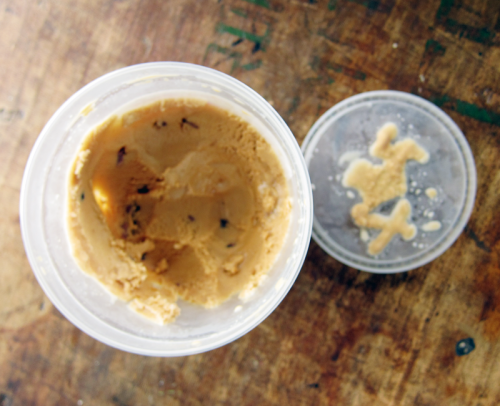 If your ingredients are already chilled, pour into your ice cream maker and let it go. When it’s nearly done, sprinkle in the cocoa nibs. When ready, pour into a lidded container and freeze until frozen. See, I said it was easy! I’ve never heard of this ice creaming method before but it looks so creamy! You got the perfect texture and that delicoius coffee flavor. Yum! don’t you love how many variations of ice cream making there are in the food blogging world? i still have to make that buttermint ice cream you made. This looks so incredibly easy! Sounds healthy too, for ice cream anyways. And a perfect way to use up that leftover coffee. As a single girl, I never seem to be capable of finishing the whole pot! I have a french press coffee maker just for cold-brewed coffee (and camping trips) too! And I don’t dillute it with water at the end either, just a little bit of milk or half & half. This ice cream looks great! okay this recipe makes me want to get an ice cream maker asap!!! love condensed milk, love coffee flavoured things. this sounds so amazing. i’d probably eat too much of it and be bouncing off the walls though. While this looks amazing (!) I really like your curtains! They’re super cute and retro-y. I like your ice cream style! Simple and good is my style too. I like my ice cream on the less-rich side so this sounds perfect. I’ve never tried cold brewing coffee but I can see the benefit of mastering that skill. I just read about Philadelphia-style ice cream too! 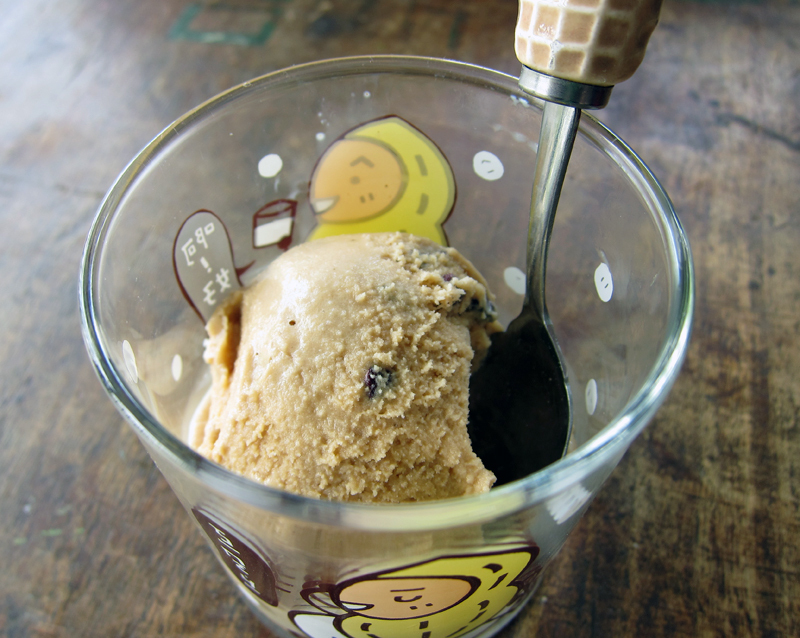 What an awesomely simple recipe … and I just love coffee ice cream. Who cares if it doesn’t have cream. Ice cream is ice cream. This is going on my list. Very interesting.. will have to give this a go. Cold brewed coffee is, I’ve heard, much better for you in that it’s much less acidic. Win win! 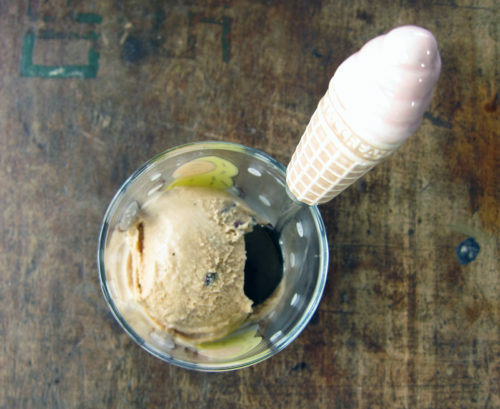 Love the simplicity of this ice cream…and I am all for anything involving coffee! Looks so refreshing. Ice cream without eggs sounds perfect to me. I think a drizzle of melted chocolate in this would be right up my alley. Hi Natalie, I’ve been making lower fat ice creams & froyos and they do take a bit longer. Make sure that your ingredients are well-chilled beforehand. And maybe I should add that to my recipe notes! Please let me know how it works out. Thanks! I ended up letting my ice cream maker run for 40 minutes instead of the usual 25. I let it freeze for about 3 hours before serving (I’d definitely recommend that). It’s a softer freeze but still so good!